Why is My Android Running So Slow? When you first get your brand new Android phone, it runs so smooth. You’re mesmerized by how responsive it is. Then a few months go by. Suddenly you have to tap things twice for it to respond. Apps now take forever to load. What happened? Why is it running so slow? There could be a few reasons. Some apps install services that constantly run in the background. As you install more and more apps, more items may be constantly running. This can use up precious memory. Restart your Android, then check under “Settings” > “Apps” > “Running” to see a list. Uninstall or disable the apps associated with the services you don’t need if possible. The “Running” screen in Apps Settings provides information on apps running in the background. If you have loaded your Android with tons of apps and data, it can slow down the device significantly. Check how much memory you have available under “Settings” > “Storage“, then have a look at the Available storage. The more you have available, the better. Consider removing of disabling apps that you don’t need under “Settings” > “Apps“. There is a cache partition on most Android devices that stores items that are accessed the most. After a while, it can become clogged with junk, causing slow performance. You can usually wipe the cache by accessing the recovery screen at startup. Each device has it’s own method for accessing the screen. Rooted users sometimes claim that clearing the “Dalvik Cache” helps with speed. 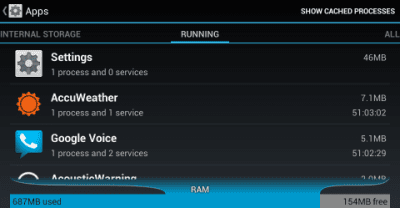 The steps for clearing the Dalvik Cache differ depending on the ROM and device you’re using. So you’ll have to “Google it” if you want to learn how it’s done. A typical recovery screen for an Android device. Be sure that you are using a high performance class 10 SD card. A card that is class 10 or higher will help read/write speeds quite a bit, resulting in better speed performance. If you have a lot of widgets on your home screen, they can use up a lot of resources as they animate or attempt to connect to the network. Remove any widgets you can do without by tapping and holding them, then dragging them to “Remove“. Device makers want to do their best in providing the latest version of the Android OS to their users. On a few occasions, over-the-air updates have been provided to devices that shouldn’t have. For example, running Android 6.0 on a Samsung Galaxy S5 may be too much for the hardware to handle. Some people may root the device and try to push a newer OS on their device as well, resulting in sluggish performance. You’ll need to turn off some of the bells and whistles, such as animations or sounds so the hardware doesn’t have to work as hard. Downgrading your version of Android may also help increase speed. Well, that covers some of the reasons your Android is running so slow. Do you have any advice to speed up your Android? Please share them in the comments section. my Android is very slow and I’m trying to clear the cached data. my phone is just new and I got it last year. its not doing any better. should I buy a new one? Banking apps loading very slow. But all other apps runs smoothly in high speed. Video songs downloaded fast .